It is extremely rare for every single component of a watch’s case, its dial and its movement to be designed by just one man. 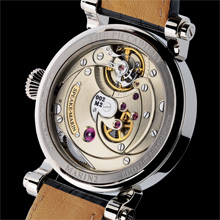 When that man has the talent of master watchmaker Peter Speake-Marin, the result is a timepiece of transcendental harmony of form and function, aesthetics and technique. The result is the Thalassa. Hours, minutes, seconds and date powered by a manual winding movement – the words almost belie the complexity of a timepiece whose each and every element has been thought out, designed, fabricated and hand‐finished with functional purpose, holistic unity and long‐term reliability in mind. 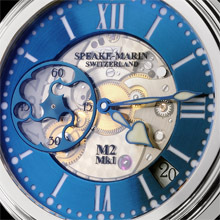 While the eye is immediately attracted to the visually striking blued‐hardened steel outer dial and the iconic Speake‐Marin wheel displaying seconds, the superb hand‐finished movement visible through the transparent sapphire inner dial soon draws the viewer's gaze ever deeper, hinting at the complexities within. The juxtaposition of blued‐steel between the warm German silver bridges of the movement and white gold of the case highlights every aspect of this uncompromising watchmaker's watch. 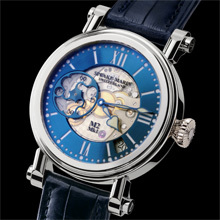 Turning the timepiece over, a panoramic display‐back filling the whole diameter of the case is revealed. The breathtaking vista of the calibre SM2m manual‐winding movement encompasses the hand‐finished, sweeping gothic curves of the German silver bridges, ove-sized jewels and screws and the elegant, double‐ended swan's neck for the regulation. It also showcases the sublime artistry of the movement’s architecture. However, the fact that this apparently "simple" movement comprises 146 parts – more than many tourbillons – all of which have been manufactured specifically for this calibre is evidence that there is far more to it than meets the casual observer's eye. From the sublime allure of its hand-finished components to the over‐engineered quality of its mechanisms, the SM2m will provide both accuracy and pleasure in equal measure for generations to come. "Stylistically I wanted this watch to be very recognisably mine. It follows very closely many of the features first seen in my original Foundation pocket watch, e.g. the topping tool inspired wheel (displaying the seconds), bridges in German silver, circular graining and large sweeping curves. I am not Swiss, French, or American and my style is very representative of myself especially as I had no constraints imposed by existing movements components or constructions I was able to design this movement exactly as I wanted. This is the great advantage of starting with a blank sheet" Peter Speake‐Marin. The nautical ambience generated by the blued‐steel of the outer dial, hands and seconds wheel inspired the name "Thalassa", a primordial sea goddess from Greek mythology and the personification of the Mediterranean Sea. The Marin 2 "Thalassa" is a limited edition of 30 pieces in 18K white gold. All bridges, levers and mainplate hand‐finished with circling, spotting, straight graining and polish.